Create Embellish Adore: KA POW! I have to admit, I really **love** Carrie Gaskin - I admire her work, and honestly, if we ever got to meet and share a coffee, I believe we would be friends instantly for life! Just my opinion - however, I sense her personality in her work, and I believe we would get along beautifully! In great attempts to put Regal Rose with Cajun, that was my biggest challenge! I could handle the other colors, but a splash of Regal Rose goes along way with me. I am **trying** to get better with some of my colors! I used the Aint love Grand! set, for a birthday card. I rolled the Sandy speckles wheel in the Regal Rose, behind him, but that wasn't enough. I put the little pennants in Rose, but I think that overwhelms it. However it completes the challenge! I water colored the guys outfit, Cajun hat & suit, and Rose megaphone. 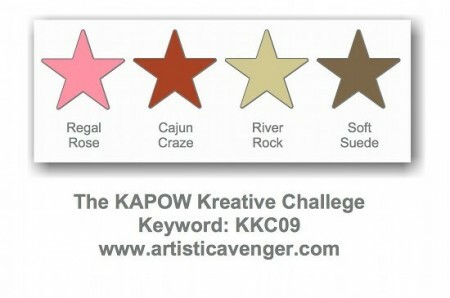 KAPOW Challenge complete - now its your turn! 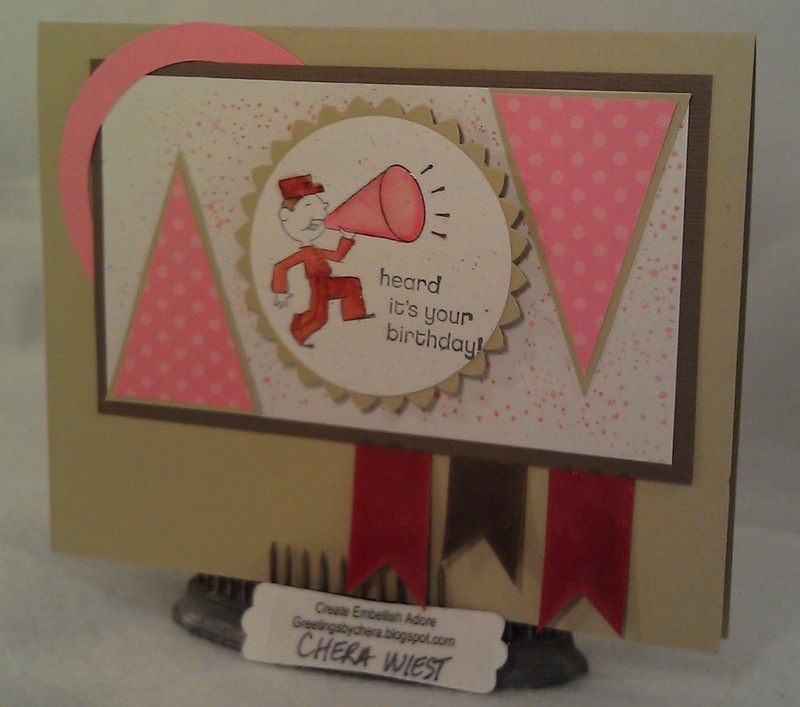 Great card Chera. I think you have pulled all the colours together gorgeously. 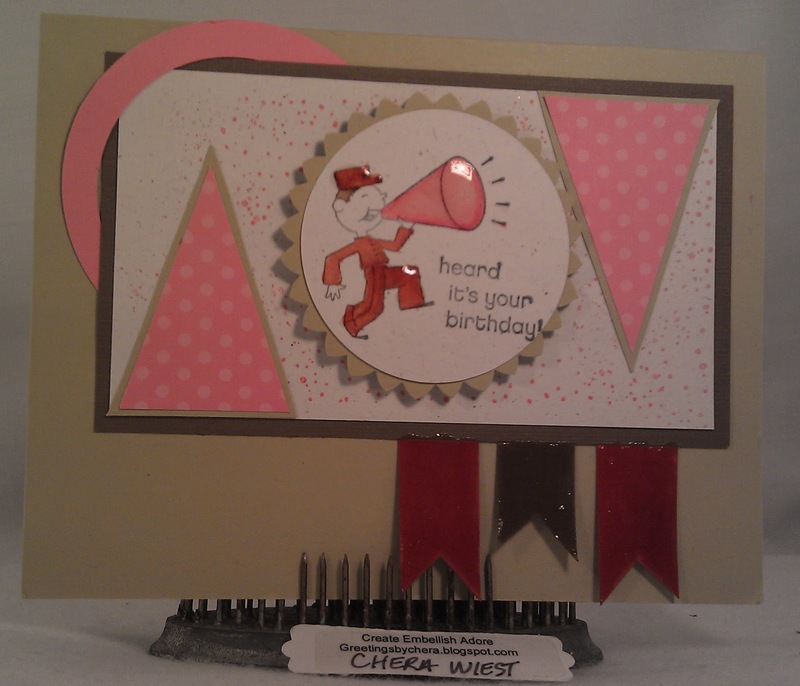 Great job Chera--thanks for participating in the Challenge this week.I found the colours hard to work with myself. I love the speckles! You are too funny, Chera. I'm pretty much a rockstar on the blog and in person (I'm being funny, but really I am :-) So glad you took the challenge and played along this week at KKC!